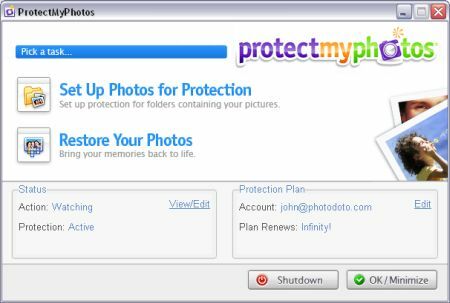 I’ve been testing out an online photo backup service called ProtectMyPhotos.com. The idea is simple: upload your photos to their service and they’ll store them for you securely for as long as you like. Then if anything happens to your originals, you can use the service to retrieve the backups. There are two service levels to choose from. A limited free service (a trial really) or a $40/year subscription. With either account you get 25 GB of storage. The free trial service only backs up low-resolution JPG images. The paid subscription service will backup full-size images of every type including RAW files (JPG, TIF, PNG, RAW, CRW, DNG, NEF, …). The paid subscription also backs up office files (DOC, XLS, …), movie files (MOV, AVI, …), financial files from Quicken and Microsoft, and music (AAC, MP3, …). Pretty cool. Signing up for the service was easy. You simply provide an email address and password to register (and standard billing info if you’re purchasing a subscription). Then you download and install a small application that runs on your computer. Installing this application was very easy. The first time it runs, it asks for the email and password you registered with on the website. Then it walks you through the process of choosing which photos to backup. The default option is called Auto Discovery. It will scan your entire computer and backup image files it finds. The auto-discovery process is smart and won’t backup temporary files (like your web browser cache). The other option is to explicitly tell it which folders to backup. After that, you do nothing. The application runs unobtrusively in the system tray, silently backing up files automatically. As new files are added or existing files are modified, it will backup those files and modifications. The backup process only operates when your internet connection is idle so you’ll never even notice it’s running. Restoring files that have been damaged or lost is just as easy. Click the Restore button in the application and then choose whether you want to restore everything or only files it thinks you haven’t deleted intentionally (“Smart Restore”). That’s it. Your photos are restored and put back where they belong. Another neat feature is the ability to browse your backed up files from their website. This gives you access to your backed up photos and files from anywhere you have an internet connection. There’s a lot to like about this service. First, it’s a great way to do backups. It is not only easy and automatic, ensuring your backups are always up to date, the backups are also stored at two separate remote locations. If your house burns down, you won’t have to worry about grabbing those DVDs or external hard drives on your way out the window. Second, their terms of service are very straightforward and fair. They do not claim ownership of anything you upload. If they can’t recover your files they’ll give you a full 12 month refund. And they even have a bankruptcy clause that says if they are required to close their business that they will notify you at least 15 days in advance so you can move your backups to another service. Third, the price is right. It is a steal at only $40/year for 25 GB of off-site storage. That’s a fraction of the cost of competitors. Carbonite (carbonite.com) charges $50/year for 25 GB, Mozy (mozy.com) charges $60/year for 30 GB, iBackup (ibackup.com) charges $200/year for 10 GB, and @Backup (backup.com) charges $625/year for 10 GB. The only knock I have against the service is that they claim “unlimited” storage but they don’t really mean it (or rather, they have a very specific definition of “unlimited”). From their terms: “If, within any month, your storage usage greatly exceeds more than the average level of monthly usage of our paid subscription customers generally you will be in violation of our ‘Reasonable Usage’ policy.” The FAQ claims that’s about 25 gigabytes which, to be fair, is more than most people will ever need. Still, I don’t like the practice of saying something is “unlimited.” Nothing is unlimited. For people with less than 25 GB of data who have a broadband internet connection, ProtectMyPhotos.com is a perfect backup solution. Simple, automatic, off-site, secure. It’s beautiful. But you’ll have to look elsewhere if you have more than 25 GB. I have over 62 GB of photos so I’m hoping ProtectMyPhotos.com offers a 100 GB or higher solution soon. Update: I received an email from ProtectMyPhotos with a correction: “Just one note, you actually can go up past 25 GB. It’s just another 40 a year to do so. There have a few (not a lot) of users that do actually go past 25 GB like yourself.” So, regardless of your storage requirements, ProtectMyPhotos is still an option.